Shop DutchCrafters Amish Furniture for all your bedroom storage needs! Speaking of storage, our Amish Storage Beds are fully capable of becoming a space saving solution in your bedroom. Our handcrafted Amish made storage beds will allow you to keep your items organized and stored away in one central location. There are many benefits with having a handcrafted storage bed in your bedroom suite. As shown in the video, there is room to store a multitude of items. Safely store your suitcases, clothes, boots, umbrellas, bedding, pillows and other bedroom essentials in the spacious drawers and open storage below the platform of this bed! Our storage beds have a variety of storage options. 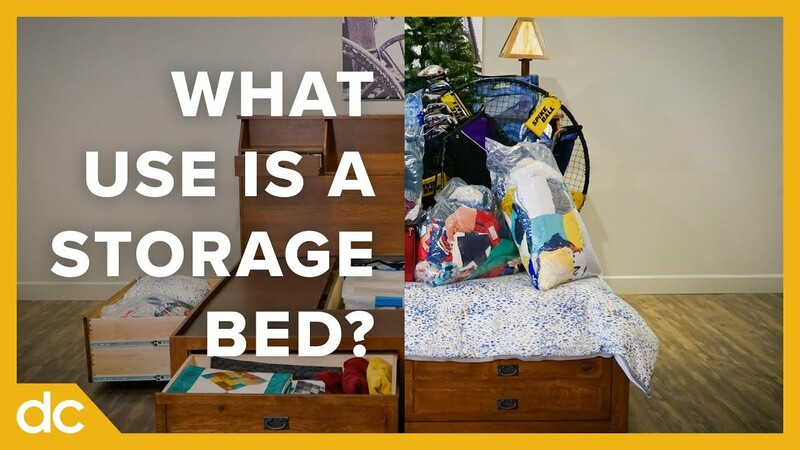 There is footboard storage, side rail storage, headboard storage, storage below the mattress and storage behind the bed for the King Size Jacobson Storage Bed shown in the video. Available storage options for our storage beds will vary product by product, but we will do our best to accompany your needs. At DutchCrafters, we work closely with our Amish woodworkers to ensure that you get the storage bed of your dreams! Showcased in this video is our beautiful Amish Jacobson Storage Bed! This storage bed has two footboard drawers, two side rail drawers (one on each side), two small drawers in the headboard, open storage in the headboard, storage under the mattress between the side rail drawers and the ability to store items behind the bed as well! Our Jacobson Storage Bed is available in a full, queen or king size and has 11 different wood types for you to choose from. Find the storage you’ve been missing in your bedroom with one of our heirloom quality storage beds today!